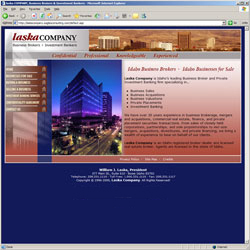 Project Sope: Laska Company is Idaho’s leading Business Broker and Private Investment Banking firm specializing in Business Sales, Business Acquisitions, Business Valuations, Private Placements and Investment Banking. 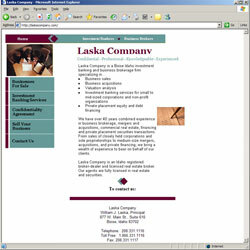 With over 30 years experience in business brokerage, mergers and acquisitions, commercial real estate, finance, and private placement securities transactions and sales of closely held corporations, partnerships, and sole proprietorships to mid-size mergers, acquisitions, divestitures, and private financing, Laska Company bring a wealth of experience to bear on behalf of their clients. including all site graphics and the menu system and content on the site that was in images converted to text so the search engines could actually index it. 2016: In August of 2016 we redesigned the site for it's second incarnation and converted it entirely to cascading style sheets and mobile friendly and also converted all of the older ASP pages over to .NET and created all new admin tools. Administration Tools: We created a user login system and a administration section allowing them to maintain their listings and organize them in a way they never could before. All of the listings on the site are database driven and are maintained through a graphical interface. 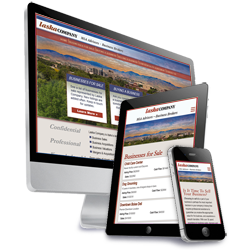 “In June of 2008 we entrusted David Maria with Vortices Design, Inc. with the task of re-designing our website. Within the first few days after it was completed, we had several calls telling us how great our new site was. In the months that we have had our new website up and running, we have received more positive comments from clients and customers then we can count. In August of 2016 we asked Vortices Design to redesign out site from scratch and upgrade it to being mobile friendly and gave all of our tools a makeover also.